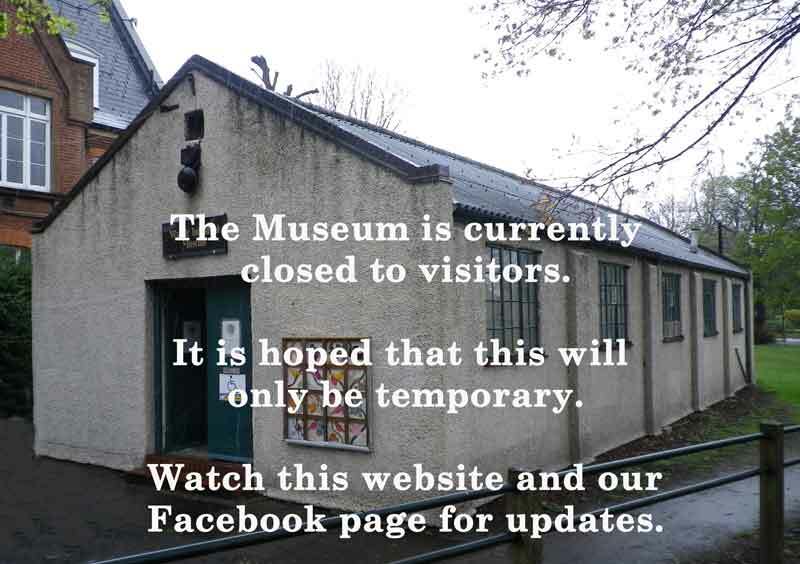 Due to issues out of our control the museum is currently unable to receive visitors. We are trying to resolve the situation as soon as we can. Once we are in a position to reopen there will information posted on this website and our Facebook page. Please accept our apology for any inconvenience this may cause. 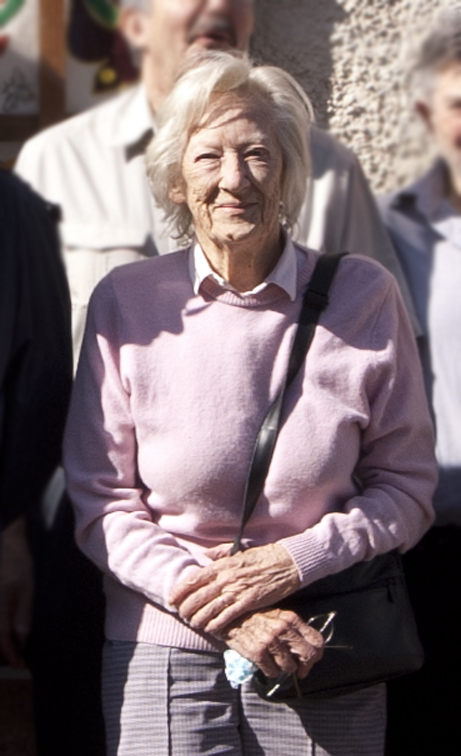 It is with great sadness that I have to inform you that Mrs Jacqueline Tucker (know as Jacqui or Mrs T), who was a long-time member, volunteer and friend to the Wandle Industrial Museum for a great number of years passed away in her sleep on 5th March 2019. The Museum offers their condolences to the family and friends of Jacqui for their loss. Details of the funeral service, for anyone would like to attend, is given below. A cremation will take place on Tuesday, 26th March 2019, at 1.00 p.m. at West Chapel, Putney Vale Cemetery, Stag Lane, London SW15 3DZ. Please dress informally. There will be family flowers only as Jacqueline particularly requested donations to either Royal National Lifeboat Institution (RNLI) or The Royal British Legion. The saying "Tenter Hooks" comes from the hooks used to hang cloth from frames in the textile industry. 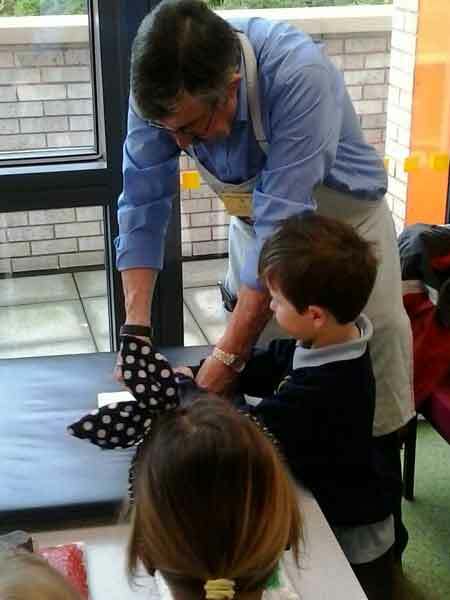 The museum is currently offering our Textile Workshop for schools free of charge. 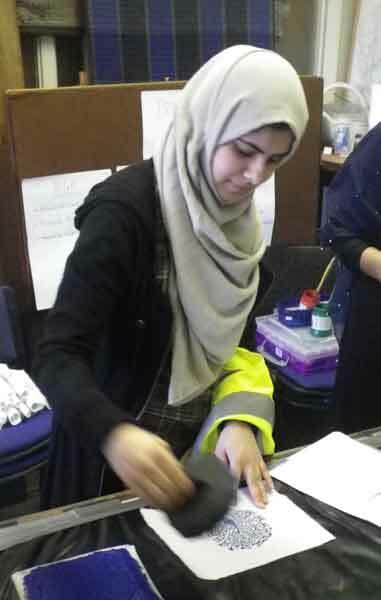 Covering the 300 year history of the textile industry along the Wandle Valley children will learn about the art of block printing, and have the opportunity to make their own print. They will have the chance to handle objects used by the printers and learn about the patterns designed by William Morris and also those sold by Liberty's of London. 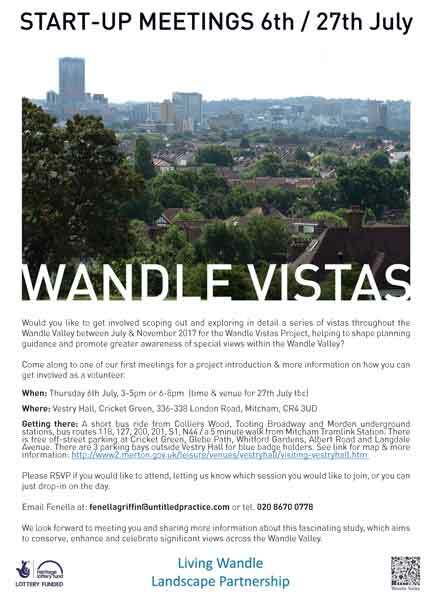 For more information or to book a workshop e-mail: office@wandle.org or call 020 8648 0127. Our volunteer Melanie has announched her new programme of walks for this Spring and Summer. To see what she is offering click here. Please note her planned walk for the 23rd Febraury has been cancelled. The museum is looking for a volunteer to look after our Social Media activity including this website. The person will be expected to look after our website pages and run our Instagram feed along with our Twitter, You Tube channel, Facebook and FlickR pages. It may sound a lot of work but it isn't. 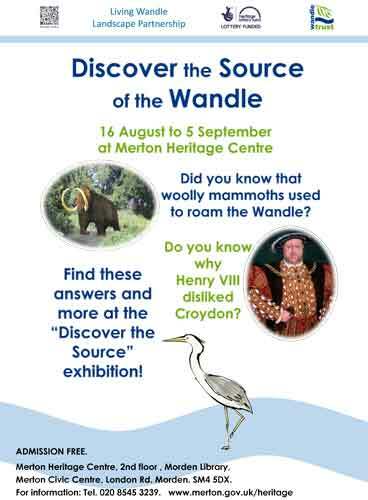 Interested then contact the museum on 020 8648 0127 or e-mail GeneralManager@wandle.org. 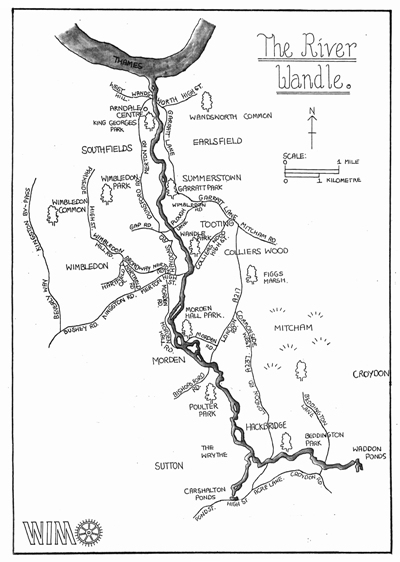 That the name Watney, of Watney's Brewing fame, is associated with a number of the mills along the River Wandle. The archive for these months is not available. The museum is pleased to announce that Father David Pennells, vicar of Mitcham Parish Church St Peter and St Paul, has been appointed our new Chair of Trustees. 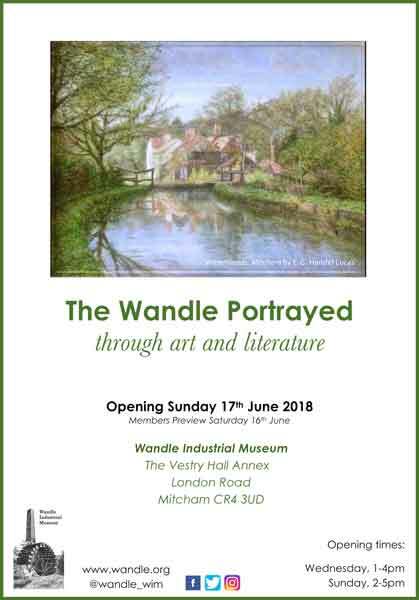 Our new exhibition “The Wandle Portrayed” is a selection of artistic and literary works depicting the river and what it has meant to those who enjoyed it or worked by it, over the years. 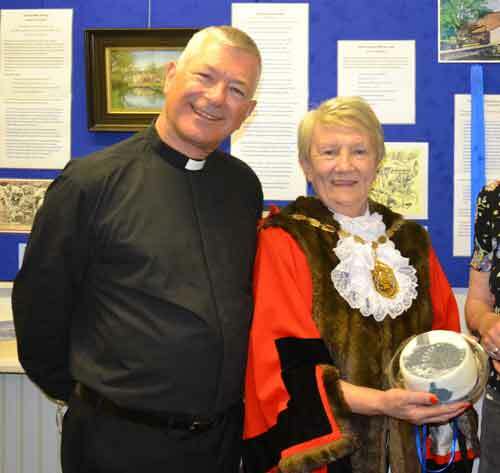 The exhibition was opened by the Mayor of Merton Cllr Mary Curtin on the 16th June 2018 pictured here with our Chair of Trustees Father David Pennells. The museum has received a sum of £1000 from this scheme. Thank you to everyone who voted for us during May and June. The money will be invested in improving the external look of our building. Something that is greatly needed. The first official walk of the Wandle Trail led by Colin Saunders took place on the 18th September 1988. To celebrate this event Colin will be leading another walk along the course of the river on the 16th September. 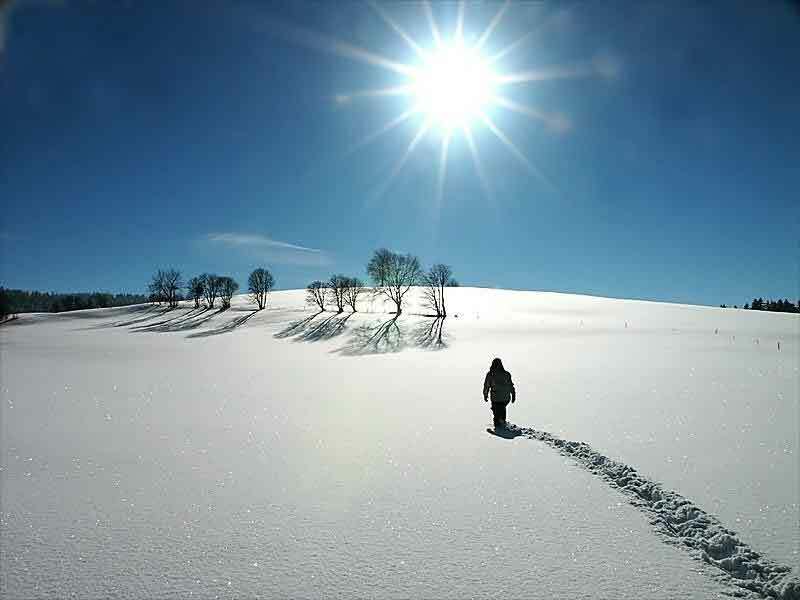 In addition there are also a number of shorter walks planned on the same day. For full details click here. The first of our planned audio trails is now available. 'Mitcham and Ravensbury Park' covers the historical area around Mitcham Tram Stop and through Ravensbury Park. 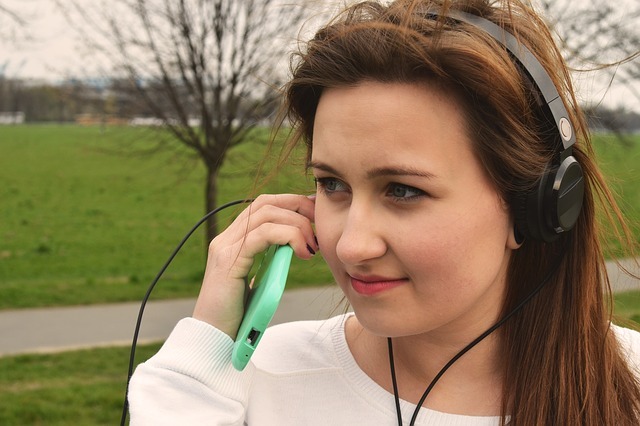 The audio and map can be downloaded to your mobile phone or tablet. For this trail please go to https://izi.travel/en/c5eb-mitcham-and-ravensbury-park/en. Further audio walks will follow shortly including Morden Hall Park and Merton Abbey Mills. So watch this page for further news. That in 1834 it was planned to use the water from the River Wandle to supply the whole of London. Those of you who are regular visitors to our website will see that we have added a banner below the museum's name. This month (June 2018) the museum celebrates our 35th birthday. We were formed by a group of local people who were determined that the heritage of the Wandle Valley should be retained. The aim of the Museum was to preserve, restore and interpret the Wandle and its industrial heritage something which we still do to this day. With sponsorship from Merton Community Trust and funding from Manpower Services Commission the first project meeting took place in June 1983 in Worsfold House, Mitcham. As they say the rest is history. As part of the Wandsworth Heritage Festival the museum will have a workshop on Sunday 3rd June from 11:30am - 1:00pm. The workshop is free. You will be able to see the method that was used to print material for 300 years along the Wandle Valley, learn about the many textile and calico works along the river including those of William Morris and Liberty's of London, and make and take home your own print based on the patterns of William Morris. All ages are welcome. As part of the Wandsworth Heritage Festival there will be a talk by Mick Taylor at Earlsfield Library on Friday 8th June at 6:30pm on 'The Calico People of the Wandle Valley'. With a history that spans 300 years from the influx of the Huguenots to the last print works at Merton Abbey you learn about some of the characters and families that made the textile and calico industry in the Wandle Valley the envy of the country. The talk is free of charge. Our new exhibition this year is about the art and literature of the Wandle Valley. With paintings and the written word you will be able to imagine a time when the River Wandle was much loved by artists and poets. Opening with a Private View on Saturday 16th June the exhibition will be open to the general public on Sunday 17th June. Normal museum entry charges apply. Help us make our museum building a place to be admired. That the organ loft at St Mary's Church, Beddington was decorated by Morris & Co. 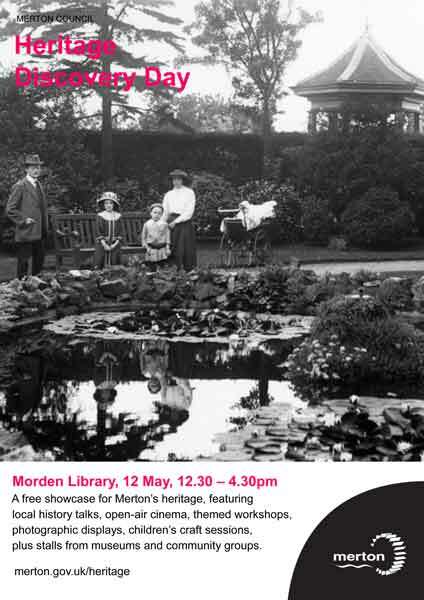 This annual event will be taking place at Morden Library on Saturday 12th May between 12:30pm and 4:30pm. If you are interested in our heritage then why not pop along. The museum will be there. 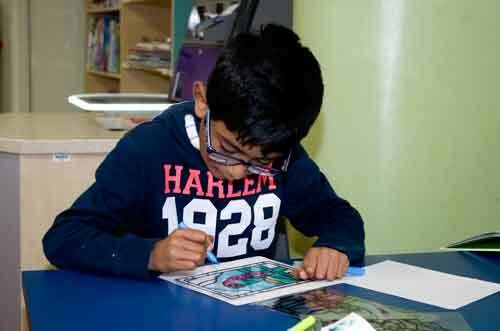 You will be able to pick up a School Resource pack, print your own William Morris pattern, colour a stained glass image or just learn more about the work of the museum. We're in the customer vote for a Bags of Help grant from Tesco. It's a scheme which gives community projects like us grants of up to £4,000 – all raised from the sale of carrier bags in Tesco stores. The public will now vote in store during May and June on who should receive the awards. Please support us in your local store! The festival takes place from the 26th May until 11th June. As part of the festival the museum is opening its doors on the 3rd June with a ‘Talk and Workshop and about textile printing in the Wandle Valley’. Takes place from 11:30am and call the museum on 020 8648 0127 to book your place. On 8th June, Mick Taylor will be giving a talk on ‘Calico People of the Wandle Valley’ at Earlsfield Library from 6:30pm. That gunpowder produced by Hackbridge Mill in the mid-1600s was of poor quality. It had a failure rate per barrel of 75%. Over the last 12 months a team of volunteers lead by The Building Exploratory have been busy researching the history of the mills along the Wandle Valley. The end result is the publication of a map showing the location of the mills and other other historical sites along with suggestions for four walks. The museum were pleased to host the launch of the map on the 22nd March. Copies of the map are available from the museum. Funded through the Heritage Lottery Fund you can find out more about the project by clicking here. 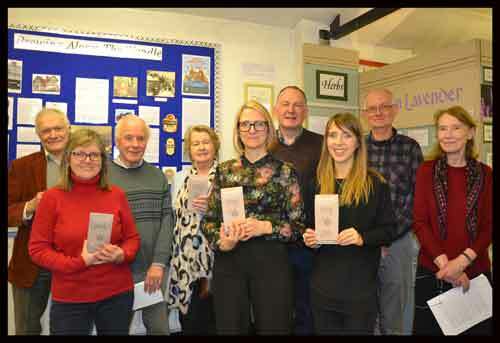 Members and volunteers of the museum and The Building Exploratory holding copies of the map. There are a number of activities taking place over the next few months so do check our future events page. It includes details of planned walks shown in the new map. There were cottages on Littler's Factory site (now Merton Abbey Mills) for the workers. Did you take part in the first walk which attracted over 200 people? Do you have any special memories of the Wandle Trail? What does the Wandle Trail mean to you? Please let us have your thoughts and memories for a special edition of our quarterly bulletin later in the year. Send them to us in the post or e-mail them to us at office@wandle.org. Our volunteer Melanie Nunzet has announced her new programme of walks. Including walks along the Wandle and over Mitcham Common there is something for everyone. Click here for full details. The museum is pleased to announce that we have produced a number of information sheets for Key Stage 1 and 2 teachers. These include (1) Water Wheel and Water Mills, (2) William Morris at Merton, (3) Natural Resources for Dyeing and (4) The River Wandle. The sheets may be found on our Outreach page. That Harland's, varnish makers based at Phipps Bridge, supplied several gallons of white enamel for use on board the Titanic. The museum's last day of opening this year will be Wednesday 20th December 2017. We will reopen on Wednesday 17th January 2018. 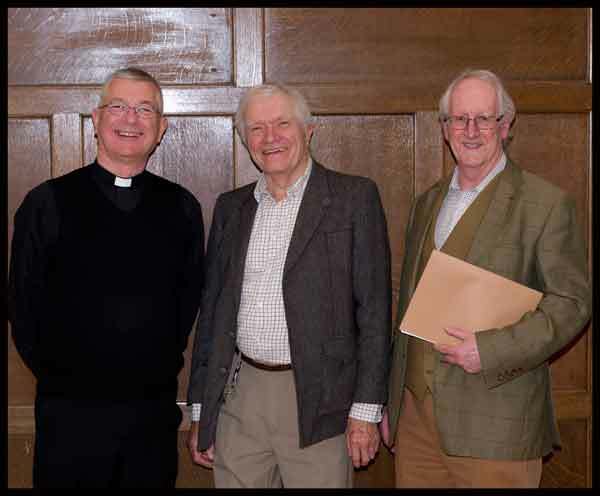 At our AGM in November Father David Pennells was formally introduced as our new trustee. Father David is currently vicar of St Peter and St Paul church in Church Road, Mitcham. Since taking up his post in February 2015 he has taken a keen interest in the heritage and history of the local area and has been a member of the museum. He is pictured here with our other trustees John Hawks (centre) and Nicholas Hart. The AGM also saw us formally announce our new logo – see top of page. From a drawing by the late Peter Harris the use of a waterwheel and a chimney reflects the industrial past of the Wandle Valley. The picture is of the waterwheel and chimney at The Willows, Mitcham. This will take place at Park Place, Mitcham on Wednesday 10th January 2018. Open to members, volunteers and partners only, it is an opportunity to mix and share your opinions about the museum. Invitations will be sent out. Visit the ponds and hills of Mitcham Common on Saturday afternoons. Easy 3-4 mile circular walks. Meet 2pm at Mitcham Junction station (bus stop on bridge). Come and join us for a free and friendly hour's walk around Beddington Park or Waddon Ponds every Friday morning at 10am. Meet by St Mary's Church, Church Road, Wallington SM6 7NJ (buses: 407 from Sutton, 463 from Mitcham). Refreshments available at church after walk. Voluntary contribution to church funds. Tour of church possible. Please note that these walks are also on the Sutton & Wandle Valley Ramblers' programme and are open to all. To be added to my mailing list please email me on mlnnunzet@gmail.com. Please note the second letter is an ‘l’, not ‘i’. Any other queries please call 07944 833605. Thank you and happy walking! That there were cottages for the workers on the Littler's Factory site (now Merton Abbey Mills). The museum will be holding its AGM on Thursday 16th November 2017 at 7:30pm. All members and volunteers are invited to attend. These will also be available on the day. The meeting will be followed by a talk about Brewing along the River Wandle. A light buffet will be available. We were sorry to learn of the passing of our volunteer Sheila Knight. 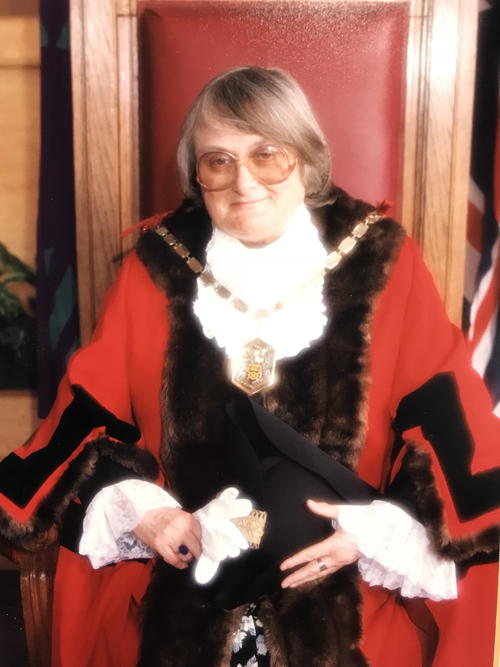 A former Mayor of Merton and Labour Councillor she was a well known public figure, and a supporter of the Museum for many years. Her funeral took place on Tuesday 31st October at Lambeth Crematorium. Our condolences go out to all her family and friends. More about Sheila's life may be found at: Merton council news page - "Council mourns former Mayor and Honorary Alderwoman"
Edward Burne-Jones was the uncle, through marriage, to Rudyard Kipling and the former Prime Minister Sir Stanley Baldwin. The Wandle Valley will be having a Super September. The Wandle Fortnight sees many activities, talks and events taking place. A full list of what is taking place can be found in the festival brochure. 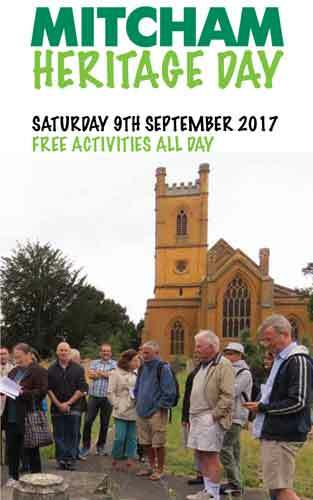 The fortnight kicks off for the museum with the Mitcham Heritage Day on the 9th September. The museum will be open on that day from 10am until 4:30pm. To see what is happening on the day click on the picture. The museum will be at the Merton Priory Chapter House on the weekend of 16th/17th September giving demonstrations on Block Printing. Pay us a visit and produce your own print. The Merton Heritage Centre is supporting the fortnight with two displays and a talk on the 23rd September. 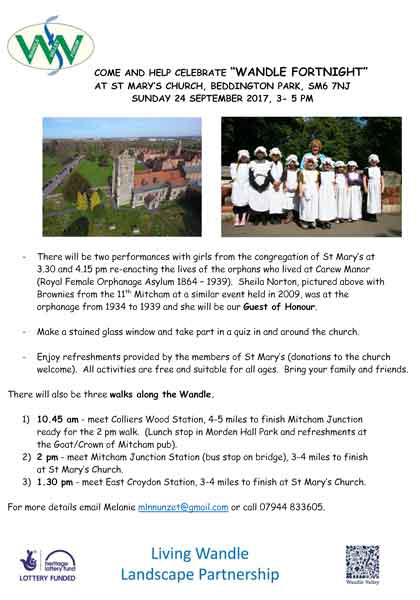 Why not spend the last day of Wandle Fortnight with our volunteer Melanie who has arranged a number of walks and activities including stained glass colouring at St Mary's Church, Beddington Park. 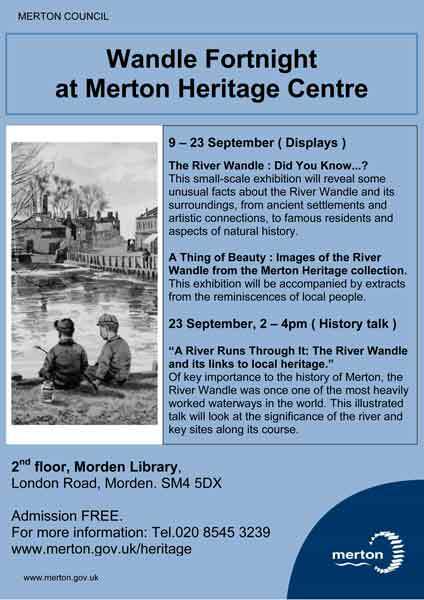 Before all of this there is an exhibition 'Discovering the Source of the River Wandle' at Merton Heritage Centre running until the 5th September. That the mills that produced dye for the textile industry were known as Drug Mills. 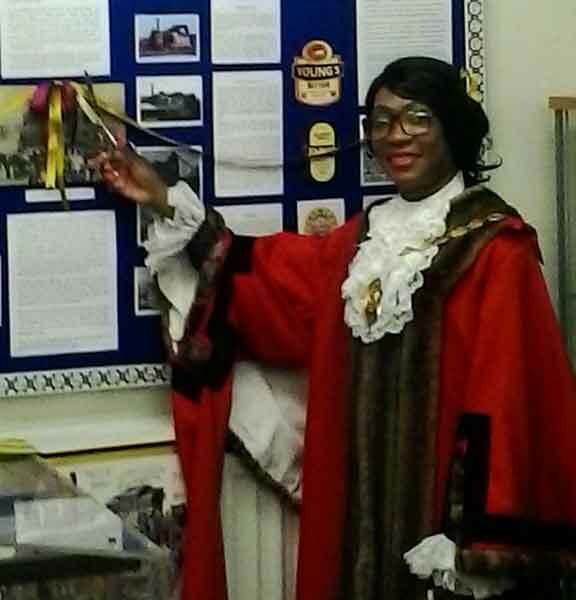 Our new exhibition was opened on the 10th June 2017 by the Mayor of Merton Cllr Marsie Skeete. Giving the history of the brewing industry along the River Wandle you will learn about the small, and not so small, brewers that used the river and populated its banks. Find out about how they slowly merged into the large companies that we know today. There is also a section on the growing number of micro breweries that are appearing within the Wandle Valley. 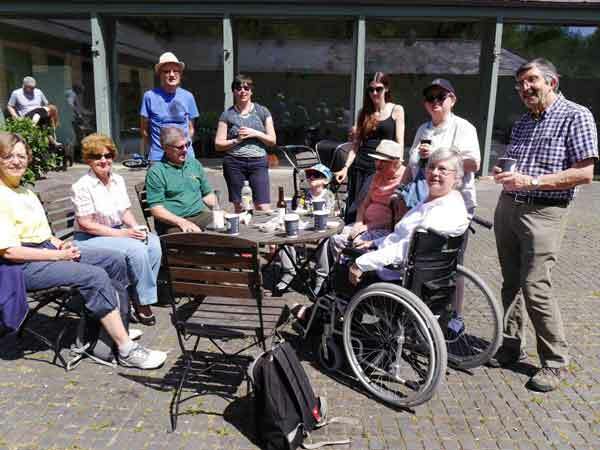 To celebrate Volunteers Week from 1-7 June our volunteers and their families were treated to tea and cake at Morden Hall Park Stable Block. This was followed by a walk across the new boardwalk over the wetlands. Without the support and help of volunteers the museum wouldn't exist. If you are interested in heritage and feel you could bring something to the museum then please complete our online application form. The last few months have certainly been a busy time for the museum. We have been out giving talks to a number of groups, demonstrating and talking about block printing to groups and schools, as well as leading walks looking at the history of the river. 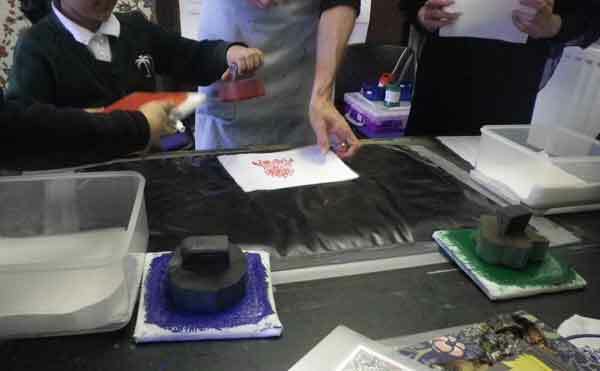 Other than the block printing demonstrations we do not charge for our activities. We do however always welcome donations. If your school or group would be interested in talk, walk or demonstration then please contact the museum. Visit our Outreach page for more information. The annual 'Community on the Green' is due to take place on Wednesday 26th July 2017. To find out more visit their website at mitchamcricketgreen.org.uk. St Mary's Church in Merton Park has four stained glass windows made at the Morris Works. The textile industry along the Wandle Valley was introduced by the Huguenots in the 17th century and remained for the next 300 years. You will have the opportunity to learn about the traditional technique of block printing and the chance to produce your own print. The session will last for about 90 mins and is FREE (donations welcome). Mick Taylor will explore the River Wandle's long tradition of manufacturing and industry. In the early 1800s it was described as 'the hardest worked river for its size in the world,' with industries such as corn milling and calico printing punctuating the landscape. Talk will last about an hour and a half and is FREE. 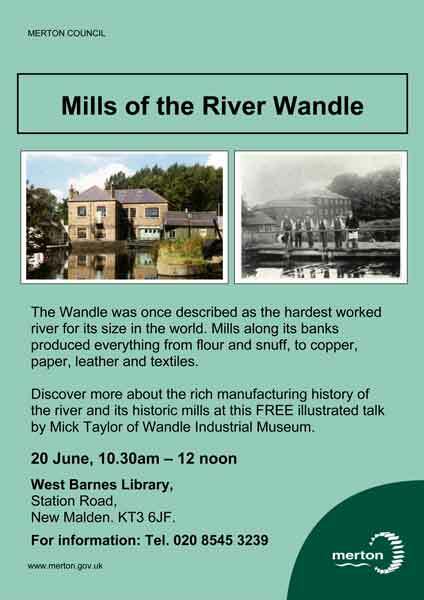 There is another chance to catch a talk on 'The Mills of the River Wandle' at West Barnes Library on the 20th June. The talk starts at 10:30 and is part of the talks programme at West Barnes that takes place on the third Tuesday of every month. This takes place between the 1st and 7th June. We would to say thank you to all our volunteers who give their time in supporting our work to keep alive the rich heritage of the industries, and people of the River Wandle. That there was once a calico print works inside the grounds of Croydon Old Palace now Whitgift Girls School.